Monthly budgets are tricky sometimes and it can be even trickier when you run into a trap month that has added expenses that you aren’t used to. I’m not talking about your typical trap like Christmas sneaking up on you in December (and for those of you that forget about saving for Christmas every year, fair warning there are only 9 months till the jolly fellow appears for his annual visit!!). I’m talking about traps that sneak up on you because we get so used to budgeting with only 4 Sundays in a month on average. For 2019 the months of April, July, September, and December all have 5 Sundays in it and this 5th Sunday can really wreck your monthly budget. For a ton of families we tend to do our grocery shopping on the weekends and when you have 5 Sunday’s in a month that means a 5th weekend of groceries to add to the budget. A 5th weekend of ensuring your restaurant budget has enough to cover you going out to eat on that extra weekend. If you have kiddos in child care, first and foremost I feel your pain!! Watch out for the months of April, July, October, and December. All of those months have 5 Monday’s in it which means a 5th week of daycare. Hang in there kindergarten is just around the corner!! My youngest Zach finally hit kindergarten this year and I felt like I got my first huge raise since I only have after school care and my youngest Kylie is only a few more years away which will be an even bigger raise (which means more fun doing the monthly budget with all that extra $$$ haha)!! 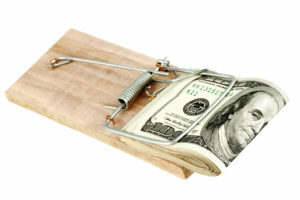 Start looking for other traps in your budget and you will quickly learn how to avoid the budget trap and win with your budget, and more importantly with your money!! !